The Relax House Vienna Café chair is crafted from Beech wood and is presented here in black, the perfect contemporary café colour. 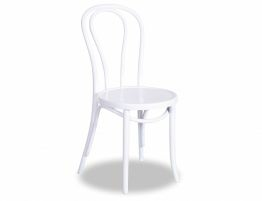 Put this chair around the beatup tables in your trendy coffee house, or pair these chic restaurant dining chairs with cloth covered tables in your French bistro. 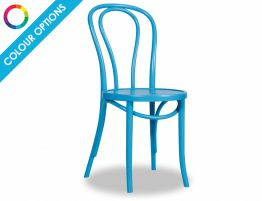 Or put these dining chairs in your home kitchen or dining area for an affordable designer touch. 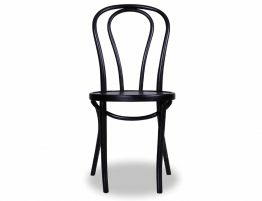 The recognisable Michael Thonet designed No.18 chair was designed back in 1876. One of the first pieces of mass produced furniture, the No.18 café chair is a fixture of bentwood design history. Michael Thonet was a German cabinet maker and an iconoclast of sorts when it came to furniture. Time forgets many things, but remembers great design, standout pieces that change the way furniture is concepted and created. Thonet left his mark on how we sit and dine in more ways than we can imagine. 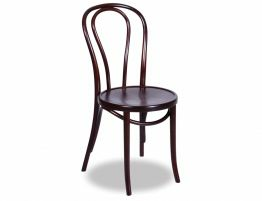 Thonet created his iconic bentwood designs utilizing one piece of wood and his methods have informed the design of each and every bentwood chair that followed. These celebrated chairs can be yours without scouring the antique shops or refurbishing old chairs. Our authentic Michael Thonet designer chairs are made in the very same factory in Poland that has made Thonet chairs for over 100 years. Our original MIchael Thonet designed No.18 Vienna Cafe chair has been constructed with precise attention all of the details that have made this stand out design so iconic and lasting. Whether you favour a modern esthetic or a polished French country look, these iconic café chairs elevate your design. These black café chairs are replete with painstaking attention to detail and stand out design touches. Take note of the beautiful sunburst pattern that is subtley embossed on the seat of our Michael Thonet designed original. Our bentwood dining chair may look delicate with its curves and slender legs but this chair is built to last. A favourite of European cafes, our bentwood original Thonet designed classic is at home in your house or commercial dining setting. Put these chic black café chairs in your café, your coffee house, your European bakery, they are classic enough to fit most interiors and built to withstand heavy use. If you are looking for café furniture, restaurant chairs, dining chairs and more, consider this recognisable designer chair. 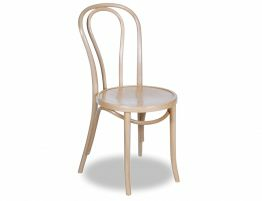 Thonet’s anthology of bentwood chairs continues to be design staples and is currently experiencing a renewed popularity. The No.18 Vienna Café chair is one of the world’s most recognisable chairs and remains unchanged over a century later. With a nod to classic European styling, a dedication to quality craftsmanship and a timeless design, the Relax House original Michael Thonet designed No.18 quality dining chair is a beautiful complement to your home kitchen, café or restaurant.